Now through the end of April you can save big by taking advantage of any of our three special offers. The Three-Pack Volume Discounts are great for those who want to speed up the treatment times for commercial applications. The Performance Packages are great for those who want to combine our most valuable accessories into one purchase. And our Preorder Special is great for those who are not urgent and can wait up to thirty days for arrival. Questions? Contact Greg or Bob for friendly advice today! Faster treatment times and larger treatment areas. Multiple property levels and/or locations. 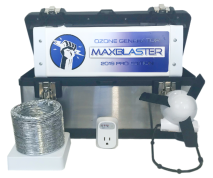 Greater ozone coverage and more equal ozone concentration throughout the treatment area. These are just some of the advantages of owning multiple MaxBlaster ozone generators. 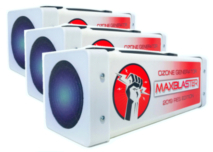 Buy a three-pack and use your ozone machines like a pro. Accessorize the MaxBlaster of your choice and increase performance, efficiency, and longevity. Includes stainless steel carry case, hourly timer, hose accessory for small spaces and cars, and booster fan to help turbo charge your ozone treatment. Visit the "videos" page of our website and see each of these accessories in action. 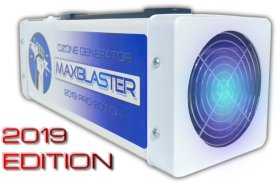 If you do not need your ozone machine shipped right away you can save money by pre-ordering and being patient with us for production and shipping. This allows us to schedule a few extra machines into our production cycle and pass the efficiency savings on to you. Preorders take up to 30 days for arrival. If you need fast shipping please order at our regular prices. Questions? Contact Greg prior to ordering.